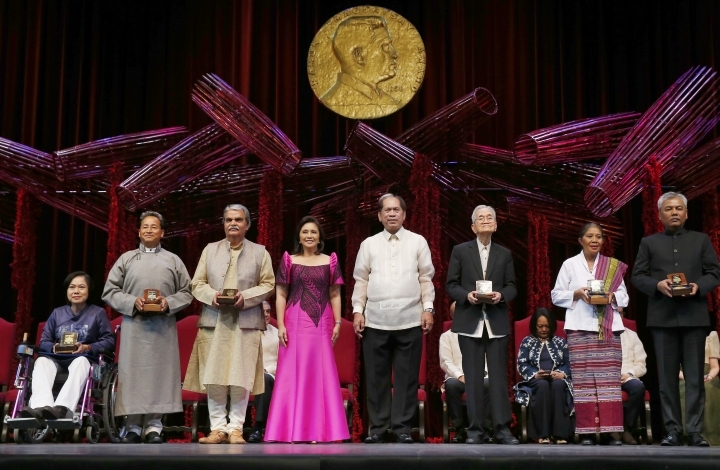 MANILA, Philippines — Six people were honored Friday as this year's winners of the Ramon Magsaysay Awards, known as Asia's version of the Nobel Prize, including a Cambodian genocide survivor who helped document the Khmer Rouge atrocities and an Indian psychiatrist who led the rescue of thousands of mentally ill street paupers. The awards, which were announced last month, are named after a Philippine president who died in a 1957 plane crash. "All this effort that I have been trying for so many decades is not in vain, it's been recognized," said Youk Chhang, who lost his father, five of his siblings and nearly 60 of his relatives during the genocidal Khmer Rouge regime and subsequent civil war in the 1970s. He escaped as a refugee to the United States before returning home to head a center that documented the horrific violence in aid of Cambodian war crimes trials. Youk Chhang said in an interview earlier this week that his recognition is also "a message to other institutions, to other countries around the world that learning from the past mistakes is significant, is important even though Cambodia has a long way to go." The massive scope of his group's work included collecting more than a million documents, producing digital maps of more than 23,000 mass graves and excavating remains for forensic examination. Youk Chhang, 57, is currently involved in a project to develop a museum, archives and library and a graduate program on crimes against humanity. Vatwani's "healing compassion" affirmed "the human dignity of even the most ostracized in our midst," the award foundation said. "Nobody understands in India, or nobody understands in Asia, what exactly is the issue ... about mental illnesses," Vatwani said. "That drew us to the cause and that has kept us moving forward and forward." Maria de Lourdes Martins Cruz from East Timor was recognized for leading efforts to help the poor get access to health care, education, farming and livelihood in the midst of East Timor's tumultuous transition to independence in 2001.